The iPod nano is a MP3 player made by Apple Inc. It is available in 8GB and 16GB memory, in nine colours: silver, grey, purple, blue, green, yellow, orange, red, and pink. The iPod Nano was discontinued by Apple on July 27, 2017. There is a built-in FM receiver inside the iPod nano, and with the radio app, radio from the FM channels can be listened to. There is also a feature called Live Pause which allows listeners to pause the radio stream, and resume it at the same place later. The iPod nano can 'talk to you', using a feature called VoiceOver. When the button on the headphones or the Click Wheel is held down, VoiceOver will speak the song currently playing and its artist. This feature is available in 20 languages. The iPod nano has a built-in pedometer. You can create a Daily Step goal, or use the 'Always On' setting so it counts all of your steps. Using the Nike+iPod sport kit, the iPod nano can be used as a fitness aid. It can measure your run by fitting into the insole Nike+ shoe pocket, then it can sync it to nikeplus.com. Nike+ is also compatible with some exercise machines. The iPod nano includes a video camera which can be used to capture video. You can add fifteen video effects, then upload it to YouTube, MobileMe, or Facebook with your computer. Replaced Mini. Color screen for picture viewing; 1 GB version released later. Anodized aluminium casing with plastic top and bottom; 6 colors available. Polished aluminium case including a larger screen, video camera, FM radio tuner, Recorder and a pedometer. Retains entire color line as fourth generation. Multi-touch screen. No click-wheel, camera, or video playback. The 1.1 OS update brought the ability of turning off by holding the wake/sleep button. Same price range as the 5th generation, except in Europe, Japan and Australia. Features iOS-like interface design and still contains "shake to shuffle", FM radio, and pedometer. The 1.2 OS update added built-in accelerometer support which works with Nike+iPod without the need to attach a Nike receiver or shoe sensor. New, larger 2.5 inch Multi-Touch screen. Unibody now made of anodized aluminium. Also, with larger screen, supports video playback. ↑ 1.0 1.1 1.2 1.3 1.4 1.5 1.6 The Product Red iPod Nano is exclusive to the retail Apple Store and its online counterpart. ↑ The yellow fifth-generation iPod Nano was exclusive to the Apple Store. It is currently unavailable for purchase. The iPod Nano was first released on September 7, 2005. 1, 2, and 4 GB iPods were available. The second generation iPod Nano was released on September 25, 2006. Like the second generation iPod Mini it was available in different colors. But unlike the Mini, the click wheel was grey for all colors except for the black iPod which had a black click wheel. The 1GB iPod was only available in silver, the 4GB iPod was available in green, blue, silver, and pink and the 8GB was only available in black, but red was added later. On October 13, 2006, a Product Red iPod Nano was released. For each red iPod Nano sold a $10 donation goes to the Product Red brand. On November 3, 2006 a red 8GB iPod Nano was released due to high demand. The third generation iPod Nano was released on September 5, 2007. It had a new smaller and wider design, video playback ability and a new user interface. A 4GB iPod was released in silver while an 8GB iPod was released in silver, turquoise, mint green, black, and Product Red. A pink 8GB iPod was also released on January 22, 2008. On October 6, 2007 Apple released OS 1.0.2 which improved cover flow and made going throw the menu a lot quicker. On November 28, 2007 1.0.3 was released which fixed a couple of bugs. On January 15, 2008 1.1 came out which had support for iTunes movie hiring, music song lyrics and more bug fixes. 1.1.2 and 1.1.3 had bug fixes. They were both released in May and July 2008. 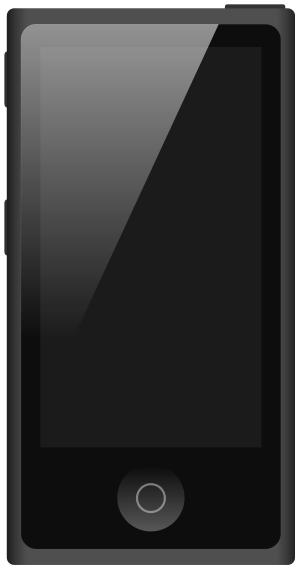 The iPod Nano fourth generation was released on September 9, 2008 and changed back to the body shape used in the first and second generation models. The six old colors (silver, black, mint, turquoise, berry red and rose pink were replaced with silver, black, purple, light blue, green, yellow, orange, red and pink. But the Product Red iPod could only be bought on the Apple website and retail stores. An accelerometer was also added to the iPod Nano. Because of this, you could turn the shuffle songs feature on and off by shaking it, go through the cover flow when you put the iPod on its side and look at pictures portrait or landscape. But videos could only be watched in landscape. Because of the accelerometer feature, the Quiz game was removed and a new Maze game was added. The iPod Nano fifth generation was released on September 9, 2009 and had a smaller price than the last generation. At the time the 8GB Nano was $149 and the 16GB Nano $179. The screen was also bigger and some new colors were introduced: Silver, Black, Purple, Blue, Yellow, Orange, Product Red, Green and Pink though the yellow and Product Red iPods were only available at the Apple Website and retailers. The fifth generation introduced a number of new things including a microphone, a pedometer, a video camera and an FM radio that had station frequencies coming from North and South America, Europe, Australia and New Zealand and Asia. The dock connector and the head jack also swapped sides so that the head jack was left of the dock connector. The sixth generation iPod Nano was released on September 1, 2010. It was a combination of the iPod Shuffle by the size and shape and the iPod Touch by the touch screen, a sleep/wake button and the user interface and icons. This iPod Nano however didn't have a video camera, the ability to play back videos, the voice-recorder, (though plugging in the headphones with a microphone would show a voice memos app) built in speaker and games. But it did still have a pedometer and an FM radio. The price for this iPod Nano was also the same GB models for the same prices as the previous generation Nano. On February 28, 2011, OS 1.1 was released with featured the ability to change song or pause by double clicking the sleep/wake button and on October 4, 2011 OS 1.2 added several new wallpapers and the ability to change the size of icons. The seventh generation iPod Nano was released on October 12, 2012. The shape was again similar to the fifth generation shape but it was still the same size as the sixth generation and still had a touch screen but only a single 16GB iPod Nano was released but video playback was also restored. ↑ Apple Inc. "Apple - iPod Touch - Technical Specifications". Apple Inc. Retrieved 21 September 2012. ↑ "Apple removes iPod nano and shuffle from website hinting at discontinuation". 9to5Mac. 27 July 2017. Retrieved 27 July 2017. ↑ "Music". Apple (United Kingdom). ↑ 6.0 6.1 6.2 6.3 "Music". Apple (United Kingdom). ↑ "Apple Introduces iPod nano". Apple Inc. September 7, 2005. Retrieved March 1, 2010. ↑ "Apple Introduces the New iPod nano". Apple Inc. September 12, 2006. Retrieved March 1, 2010. ↑ 10.0 10.1 10.2 10.3 "iPod nano – Read the technical specifications". Apple. Retrieved September 2, 2010. ↑ 11.0 11.1 11.2 "Which iPod has the best quality audio?". Macintosh How To. 24 November 2010. ↑ Topolsky, Joshua (September 17, 2008). "Official : Mysterious new 4GB iPod nano 4Gs begin appearing on store shelves". Engadget. Retrieved September 17, 2008. ↑ "Fitness Updated". Apple.com. Retrieved November 29, 2011. ↑ Apple Inc., Apple press release library, Retrieved September 19, 2007. ↑ Mactracker (mactracker.ca), Apple Inc. model database, version as of July 26, 2007.